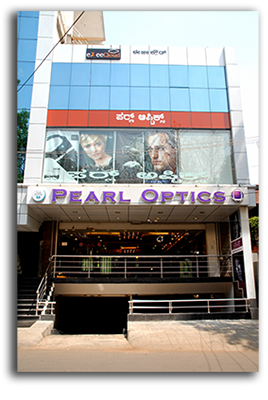 A simple philosophy of bringing the wide and diverse range of optical goods and services under one roof, paved the way for PEARL OPTICS in 1994. We feel privileged in providing an exquisite shopping experience . Sincere professional service is the essence in presenting the worlds most premium and fashionable range of spectacle, sunglasses, and contact lenses. With one-of-kind retail store we have successfully risen to be among the best optical retail experiences in the country showcasing only the genuine brands. A lot of attention is given in satisfying the diverse needs of our customers. With the present store boasting a comfortable retail experience spread over 4250sq ft on two floors and an unmatched ambience adds to the pleasure of selecting that perfect eyewear for you. At Pearl Optics, our clients are the most important part of our day ! Established in 1994 with a 600 sq ft store we have grown to a 4250 sq feet store. Our presentation comprises of a huge range of spectacle frames and sunglasses to suit every need and every budget. The wide range of spectacle frames and sunglasses to choose from will make it a pleasure to select the best one with a sense of satisfaction. We pride in presenting the latest and the largest range of designer brands of spectacles and sunglasses from the world over. We have an exclusive floor dedicated to luxury range of sunglasses for your convenience. The ambience created at the store is of global standard. Care is taken to give you a touch and feel experience before you make your choice. All orders dispensed undergo stringent quality controls before it is finally dispensed to you thus providing you a trouble free experience. We have a state of art eye testing facility coupled with qualified optometrists who will take care in dispensing you a comfortable px. We are well experienced in dispensing you all kind of soft and semi-soft contact lenses. Parking is a big nuisance in today’s world. We provide you ample parking facilities for your cars and two wheelers in front of our store making it comfortable to walk in even in rainy weather conditions. We take our after sales service very seriously and have a devoted team to look into the same.